Check the Routes by Country/City page for more routes. 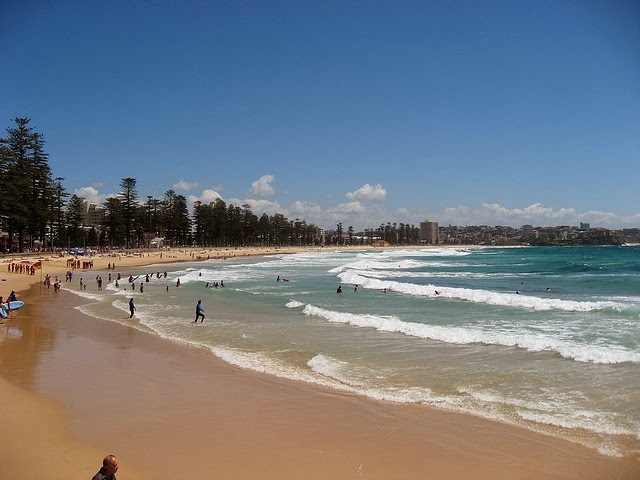 If you have a few days or more to spend in Sydney, then you should definitely take time for a trip to Manly Beach, at the entrance to Sydney Harbour. 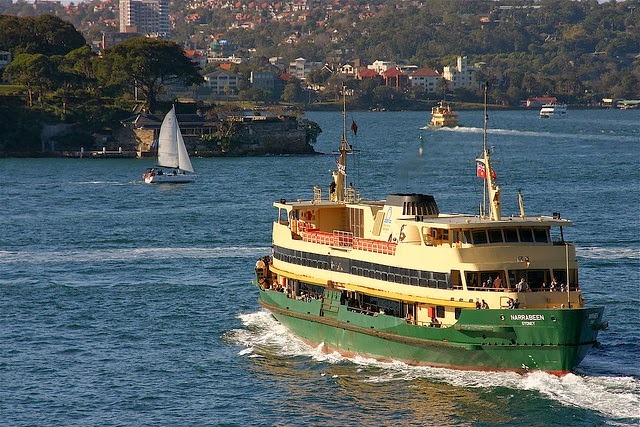 Just the trip there, by itself, is worth it, riding the Manly Ferry from Circular Quay all the way through this scenic bay, surrounded by sailboat regattas, lighthouses, islands, and beautiful waterside neighborhoods. And once you get to Manly, you'll find a fairly laid-back beach town with a tree-lined promenade, amazing surf and cliffs with panoramic views over the coastline and the Pacific. 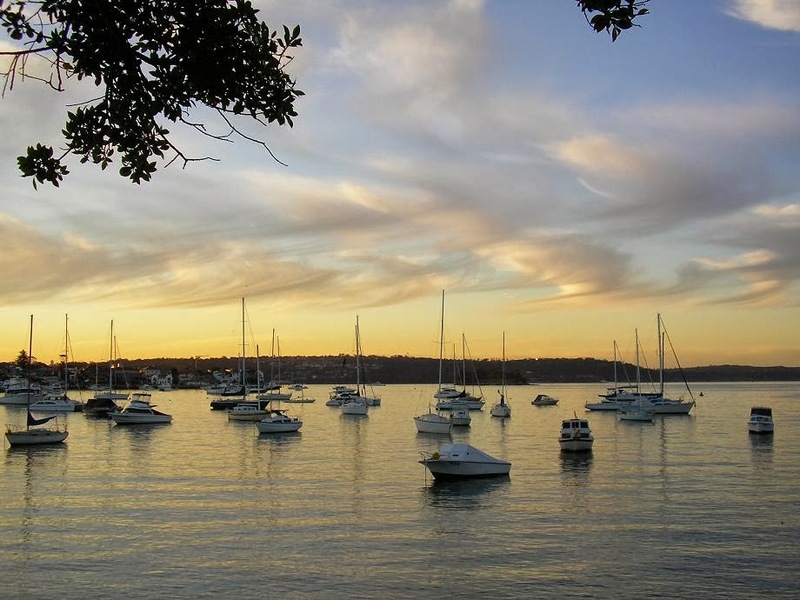 Manly occupies a narrow peninsula along the coast, just north of North Head, at the harbor entrance. 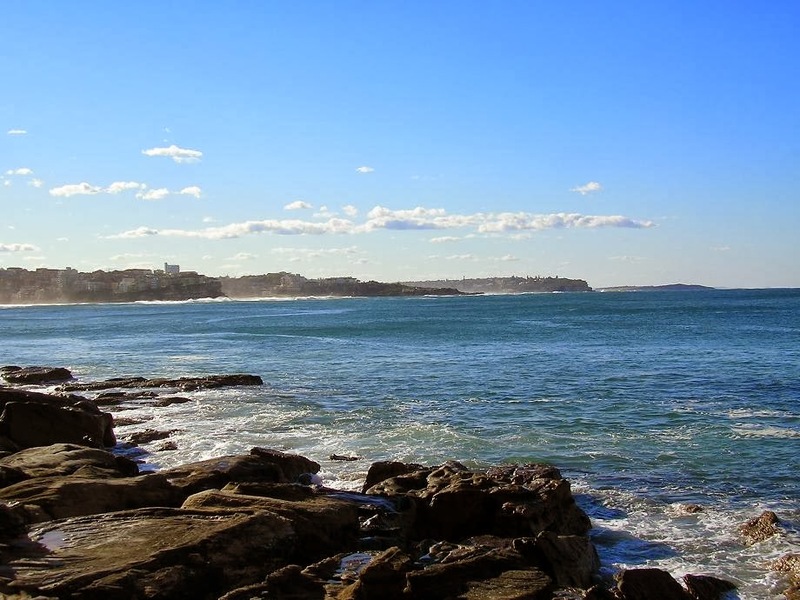 The back side (west side) of this attractive beach town, where the ferry lands, looks out over relatively peaceful Manly Cove on Sydney Harbour, and has its own beaches. But just 400 meters eastwards, the main beach is pounded by gigantic Pacific waves, and is a sought-after destination for surfers from around the world. And, of course, what better way to quickly get to know the area than to bring your running shoes and head off exploring! This route is fairly simple, needing little explanation: it just heads from the ferry docks to the beach, traversing up and down the beach, and then continuing on along more secluded Cabbage Tree Bay, with its rocks, ocean pool, Shelly Beach and a hilly overlook. So, standing there in front of the Manly ferry station, let's go! Cross the Esplanade and then then follow the wavy stripes straight up the main little shopping street, the Corso. This street has a park-like pedestrian area for most of its length. 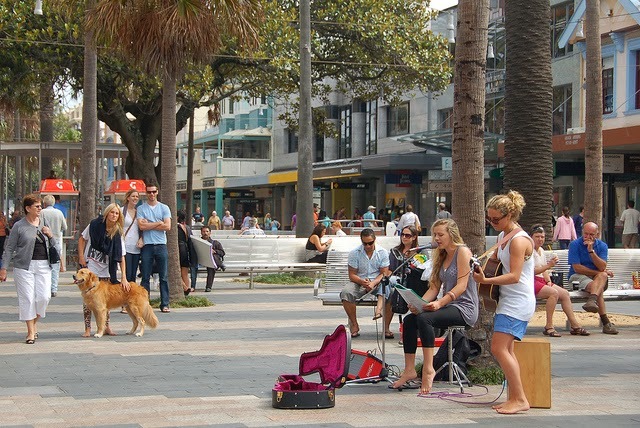 The Corso is often the site of various festivals held in Manly each year: the Jazz Festival in October, the Food and Wine Festival in June, and the Arts Festival in September, among others. I was there once for the Jazz Festival, with live music stages on the Corso, and it was a lot of fun. In just 400 meters, you come to the main beach, lined by a par with multiple rows of big Norfolk Island pine trees. You'll probably see that only part of the beach is open for swimming, marked by portable flags at each end of the swimming area by the life-guards. 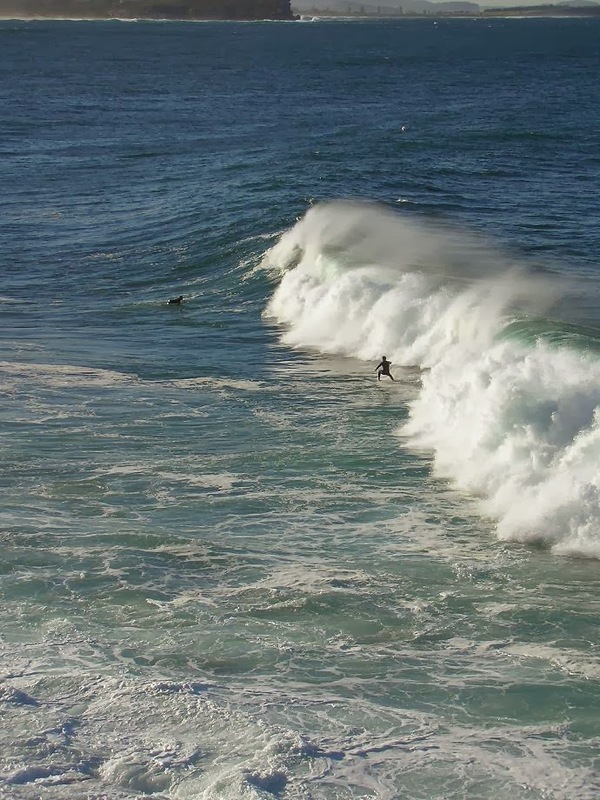 They can only rescue people in the treacherous surf if they can reach them quickly, paddling their surfboards. So they limit the size of the swimming area, according to conditions. Now turn left and run north, either near the trees or out along the sand. The part of the beach north of the Corso is called North Steyne, and the section to the south is South Steyne. The whole beach is popular with surfers. Just keep running northwards until the beach ends at the 1.5-km mark (about a mile). You could continue past the next spit of land to further beaches, but that's a different route! Now turn around and run south, past the Corso again, along South Steyne. The beach ends, at the 3-km mark, right at the Manly Life Saving Club (nobody has drowned at Manly since they began patrolling more than a hundred years ago!). Just behind the Clubhouse, turn left and take the trail that continues along the water, Marine Parade. This pedestrian street lines the rocks out in Cabbage Tree Bay Aquatic Reserve, with waves bouncing over the rocks far out into the bay. At the low spot where the one side street, Bower Lane, comes in from the right, notice how the paint is peeling off the houses. The waves jump explode over the street here so often and pound the houses that the paint doesn't last long. Sometimes you have to wait for the right moment, between waves, to run through this spot! Right after that, you'll pass the swimming pool built out into the rocks, protected from the waves. In another 300 meters, you'll come to little Shelly Beach, a secluded cove popular with families with small kids because there are not normally any waves here. The hilly headland to the left (east) protects this great little spot. There's an idylic restaurant to the side, and a barbeque area, and you can often see diving classes practicing out in Cabbage Tree Bay: this is one great hangout! Run to the back side of the beach and take the sidewalk up past the barbeque grills to the parking lot above. At the parking lot, stay along the left side the few steps as you run to the lookout over the cliffs along the Pacific. Now turn left and run along the trail that circles the headland, along the yellow fence. This is one of the most spectacular running spots you'll ever encounter, with the waves thundering against the rocks below! NOTE: There is a trail leading uphill from the other end of the parking lot which heads further south through the bushlands of Sydney Harbour National Park. You could follow it for some much longer runs. 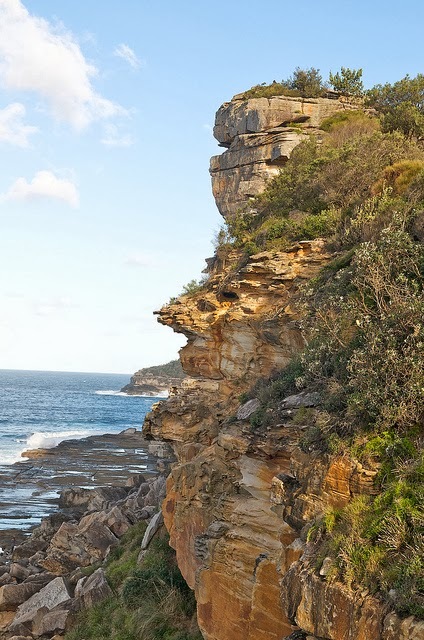 It's part of the Manly Scenic Walk, which continues through North Head at the mouth of the harbor. There are great lookouts from the cliffs, old fortifications and the quarantine station, too. The park closes in the evenings at 8 PM. The headland trail soon loops back out to the parking lot again, where you follow Marine Parade back towards the Manly Life Saving Club. Now, at the club, head west down Ashburner Street, which is a quiet residential street with some traditional Federation-style houses. In a few blocks, you'll be back at Manly Cove, with its own little beach and park. Turn right and run the last 300 meters back north to the ferry terminal. Now it's time to head to your favorite beach spot, have a swim and a shower (in one of the three surf clubs along the main beach, or at the beaches on the Cove side), and then buy one of those great-looking ice-creams along the Corso! The beaches of Australia in general are awesome. It's a must-visit when you are here. Just remember to bring your swimmers out from storage and wear lots and lots of sunblock! Have fun!